Moss Landing, on the eastern shore of the bay, at the head of the great submarine valley, lies 12 miles 36° true (N by E % E mag.) from Point Pinos and 14 1/2 miles 128° true (ESE 4 E mag.) from Santa Cruz lighthouse. It has a small amount of domestic trade— lumber and general merchandise being received and grain, fruit, and farm products shipped. A wharf has been built out to deep water, the depth at the end varying from 30 to 50 feet, according to the season of the year, being less in winter. The anchorage is unprotected, but the holding ground is good; vessels anchor southward of the wharf to avoid the deep water off the end. The prevailing winds are northwesterly, with a few southeasterly gales during the winter; the latter are dangerous to vessels at anchor. No supplies can be obtained except by previous arrangement. Communication is had by regular coasting steamers and by rail. Most of the earth’s continents are girded by shallow shelves that slope gently away from the land for many miles, their depths seldom greater than a few hundred feet. On the East Coast of the United States, the shelf stretches for more than one hundred miles in many spots, before giving way to a steep slope that drops into the abyss. On the West Coast, the shelf is narrower but still a substantial barrier to the deep. Off Monterey, things are different. Here an enormous canyon cuts the continental shelf in two, bringing deep water remarkably close to land The canyon is so close that erosional forces at its tip keep nibbling away the old pier at Moss Landing, located at the bay’s midpoint. The dilapidated pier used to be twice as long, but with troubling regularity its leading edge keeps tumbling into the head of the invisible canyon. Salmon and steelhead were also abundant in Elkhorn Slough. They were caught with gill nets here in the early part of this century by local fisherman, along with the introduced striped bass, which were sometimes as large as 50 pounds (per. comm. Bill Leeman). In the early1900’s Bill Leeman’s father rented boats to hunters at Moss Landing. He tied the boats near the only major culvert that blocked Moro Cojo Slough at Moss Landing Road. Steelhead were so abundant and persistent in their leaping efforts to swim past the culvert that it was young Bill’s job to remove trapped fish from the rental boats. Leeman also recalls catching salmon with other boys from the Moss Landing pier with bent nails attached to string (1900-1910). Although these observations were made during the Reclamation Period, the anadromous and freshwater fishes must have been extremely abundant throughout the Monterey Bay, and its rivers and wetlands for hundreds and probably thousands of years. I’m not sure if we’re talking about the same pier on Moss Landing (Island) I called it as a kid. But as a kid, during my era, there was a public pier off the island into the ocean but was already in ruins. It had a cyclone gate put across it which the public had put a hole in and still continued to go out and fish off of it. This would have been about 1968 to 1973/74. I was eagerly searching your story for “what happened to the pier,” but didn’t find the answer. When I returned to the area as an adult, about 1980, there was a petition from the (mayor, I believe) of Salinas. I signed it. 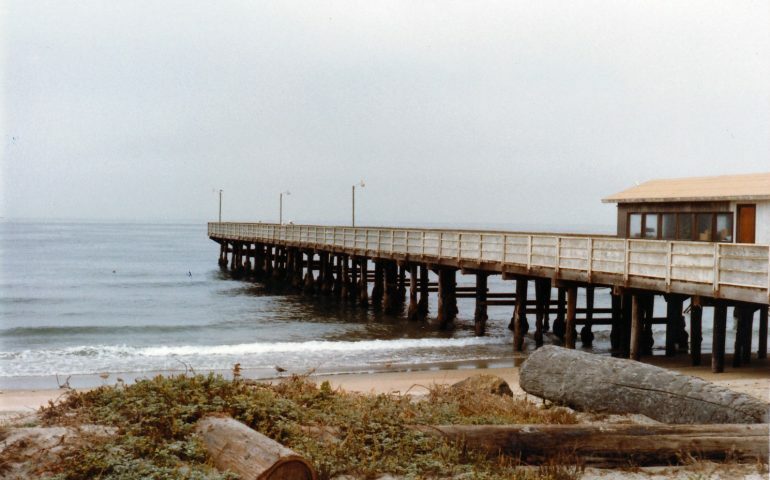 It was to put a new public pier there in moss Landing. My retired, elderly uncle lived in a small shack house behind the original post office in Moss Landing during my childhood years. My family camped at the end of the island, where that abandoned pier is in the water at the mouth of the harbor (across from the smokestacks). That whole end of island is a horrible waste now and no public can stay overnight there anymore. My uncles home is gone (it was a ruin) and the p.o. is an antique store. There is an old lady whose home is on the island, don’t know her name. She lives on the ocean side and has a fenced garden with the remains of a fallen tree made to look like a dragon. Her grown daughter was outside (this woudl have been about 2014/2015). She told me her mom watched for years how the Monterey Bay Scientific folks took their large boats out at night into the bay there and would, the mom believes, dredge up the bottom. The old lady believes the canyon talked about today was either added to or made by the research folks. The daughter wanted so much for me to be able to talk with her mom (as I “grew up” on the island) but mom was sleeping. I wish I could have visited her as well. Her son i met too because he was working the gate of the street faire there (held in July). I played on that island every summer with my 4/siblings. Joyous days. my aunt worked in one of the canneries. Her friend “Ethel” lived in a trailer home on the island. AT some point Ethel was told she’d have to move from the island. the Moss Landing Research Lab which is now down the road from the island, was built on the island while I was a kid. We used to catch their water filled balloons from the currents and take into the scientists. They were checking the current. In return, they would give us barefoot, sandy kids a hershey bar. My aunt who had relocated to Soquel w/my uncle til he passed, told me the research lab had moved down the road cause sink holes were coming up under their lab. As an adult I noted that the Monterey Bay scientists had first taken over the “Parking lot” to the old pier and put fenced pools with rescued sea life, while the scientists stayed in trailers. Now it is all vacated but one still can’t go in that vacated area. Why? The Monterey research built that huge bldg and added a sea wall. It is nice that they allow public to walk through their parking lot gate and onto the sea wall, afterall they took away most public access. I went in one day and asked the lady about what year the beach quit being flat and became so steep. She told me it was always steep. Nope, I told her. I used to have campfires on it at night. Was flat. When the tide was out, past the public pier, we coudl walk all the way out to the end of the pier, flat land. Probably further but we were with flashlights at night, and spooked. Funny. Does nature really make such a canyon that deep in a short amount of years. I really wish i knew about that offshore canyon whether it was helped to be created, or just was. I was sad that I couldn’t have my kids learn to body surf at Moss Landing like I did as a kid. Great for surfers, I think. Don’t dare get in now by walking. Sad that Phils Fish mkt is on the chopping block (hope its still there cause plan on visiting again). They told me the Monterey lab people are trying to push them out cause they want to take over more. Greedy EPA. hope you have some answers for me. Thanks.